In the 1970s, famed astronomer Carl Sagan and space artist Jon Lomberg, who contributed art to Voyager's Golden Record, collaborated on a unique set of images that are now available as an exclusive poster from Astronomy. How might human civilization be recorded in a galactic encyclopedia? Encyclopedia Galactica is the compilation of a series of paintings by award-winning artist Jon Lomberg, in collaboration with the late astronomer and science popularizer Carl Sagan. Below is the story of Encyclopedia Galactica, told by Jon Lomberg himself. 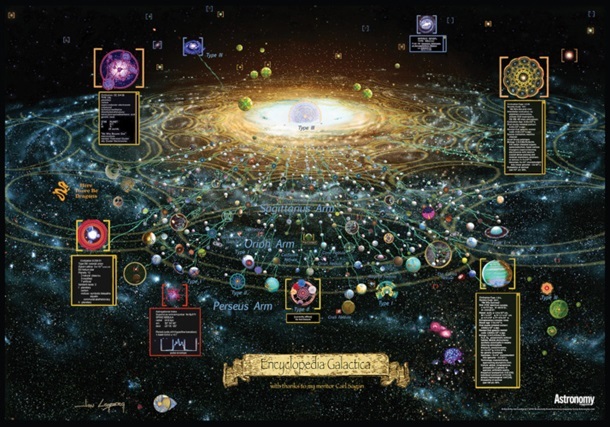 Encyclopedia Galactica is a unique poster exclusively available from Astronomy magazine through MyScienceShop.com, depicting our home galaxy as a network of civilizations at varying stages of technological advancement alongside our "Pre-Contact" Earth. 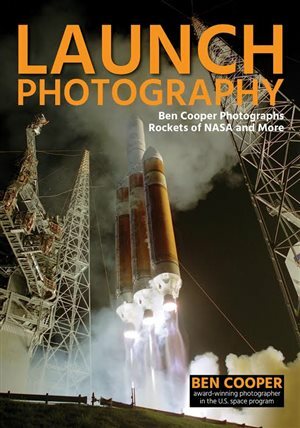 You can get your copy here! The Encyclopedia Galactica is a series of paintings that was the basis for a sequence in the TV series Cosmos, and now realized as a new poster available through Astronomy magazine and MyScienceShop, shown below. The concept and its realization was a bond with my friend and colleague Carl Sagan. More than 45 years after we began it, I still imagine what it might teach us if we can ever find it. The new poster shows some of the civilizations in our corner of the galaxy, as well as other encyclopedia entries. Green communication channels tend to fall along galactic radii, since that is one obvious, guessable direction for mutually successful Search for Extraterrestrial Intelligence (SETI) transmissions and searches. Natural galactic neighborhoods may thus be formed. The “wi-fi link” to the Encyclopedia Galactica may lie along our galactic radius, password “anti-center” (the least noisy direction to search). Although not yet part of the communications network, Earth is shown by its own interstellar calling card, the Voyager Golden Record, whose familiar cover was designed by Frank Drake and myself. The poster uses my recently updated Portrait of the Milky Way, now also available in MyScienceShop, here. The Encyclopedia Galactica, as it appears on a poster available from Astronomy magazine. I painted Dyson Lattice in the winter and spring 1975. I can date this with some accuracy because of the letter below. Carl was trying to plan a Toronto engagement to coincide with a visit with me. My goal was to complete the painting—and a draft of the text— by the time he arrived. Before and during our visit we had some intoxicating creative duets writing up all the verbiage. He enjoyed playing with the phenomenal scientific ideas he worked with all the time, and for me it was an incredible education in arcane details of astrophysics, biochemistry, and more. Carl and I had become friends in 1972. What started with a fan letter led to a partnership based on a shared cosmic perspective. We each felt an intellectual and creative attraction that was as fun and stimulating as a friendship can be. At first I was in awe of him, but he talked to me as an equal when we spoke about the cosmos and the beings who might inhabit it. He admired my intuition on a topic where intuition is rarely useful. I think I offered an artistically based — call it visionary — point of view that he did not find among the university scientists and NASA engineers who peopled his professional world. In any case, we saw a lot of each other, mostly at Cornell, where I came for intensive creative sessions on the many projects we were doing. Sometimes he’d invite me to scientific meetings or to join his family for Thanksgiving. In Ithaca, Carl and Linda Sagan often hosted gatherings where I met authors Isaac Asimov, Theodore Sturgeon, and Diane Ackerman, and astronomers Frank Drake, Fred Hoyle, Thomas Gold, and Freeman Dyson. These visits always taught me things that ended up finding their way into my artwork, especially in the series of paintings I called Encyclopedia Galactica, based on an old trope of sci-fi — Asimov used it in his Foundation series, as did Douglas Adams in The Hitchhiker's Guide to the Galaxy — but it had never before been visualized in art. Artist Jon Lomberg in 1978. I had begun the series before we met, but the conception had been strongly influenced by Carl’s book Intelligent Life in the Universe (1966). I brought it to show him on my first visit to his home in Ithaca in 1973. When he saw the Encyclopedia Galactica painting, Carl’s reaction was, “I’ve been waiting to see this painting my whole life!” He swapped me an original, signed Pioneer 10 plaque for it (we both thought we’d gotten a good deal) and also asked to use it as the cover for his book Communication with Extraterrestrial Intelligence. This is the transcript of a classic conference about SETI (then called Communication With Extraterrestrial Intelligence, or CETI) held in Soviet Armenia in 1971, attended by all the major SETI pioneers, including Drake and Dyson. Another painting I showed Carl that night depicted the type of civilizations he had written about, located in the galaxy. A version of this painting appeared as the frontispiece in The Cosmic Connection. I later donated it to the Arecibo Observatory, site of many SETI observing programs. Carl urged me to continue with the challenging task of imagining extraterrestrial civilizations. Dyson Lattice is the final, largest and most ambitious of these paintings. Physicist Freeman Dyson described the concept at the 1971 CETI conference. Dyson has been one of the key voices in the discussion of the possibilities for advanced technical civilizations elsewhere in the galaxy. He has noted that civilizations require energy in increasing quantities as they develop. Advanced civilizations might have such enormous demands for energy that they might try to harness the greatest possible source — all the energy of the sun their planet orbits. Dyson suggested the solution: build a shell surrounding your sun and receive almost unlimited power. Such fanciful structures have been dubbed Dyson spheres. Dyson Lattice symbolizes that design. Within its embrace are the natural planets this sun had formed, as well as artificial structures on a scale that boggles our minds — like an ant contemplating the engineering of a skyscraper. Energy gathered by the lattice is shifted and transformed throughout the system as represented by the colors of the spectrum, with the waste energy (in blue) emitted in discrete, quantized packets of information beamed out to the rest of the cosmos. Dyson Lattice was not the last variation on the Encyclopedia Galactica I did with Carl. In 1976 he commissioned me to create an installation for the new home he was building in Ithaca. In his living room I built a 6-foot-long 3D model galaxy, painted on layers of Plexiglas in blacklight paints, and lit by ultraviolet lights. With all the room lights off, the glowing pinpoints of a spiral galaxy filled a big tank like an aquarium full of stars. The portrait of me between the Plexiglas layers during construction shows the scale. The artist stands between sheets of Plexiglas to show the scale of his model galaxy. The symbols I use to represent civilizations, such as the Dyson lattice, are not intended as photo-realistic depictions. Rather they are icons, somewhat more complex than logos, perhaps similar in spirit to the crests of powerful families or organizational seals. The designs I chose to chose are mandalas — radially symmetrical designs — that are widespread in human art and in nature. I fancy their appeal may be universal as well, as in the use of galactic radii to ease the search for signals. Most art mandalas are done within established cultural traditions. I tried to adapt the concept to the extraterrestrials — what would their mandalas be like? These original cosmic mandalas were all done in the period between 1972 and 1977. To me the mandalas suggested many things: the appearance of a portal through space; or perhaps a symbol of a highly evolved technology; or many civilizations linked to some common purpose across an entire galaxy, something that might translate as “enlightened technology” or even “technology of enlightenment.” Carl liked their ambiguity. Here’s where the story gets a little weird. In 1980 I had an exhibition at the Saxe Gallery in Toronto, where Dyson Lattice was first exhibited). One day I received a call from the gallery saying that a couple was most anxious to meet me. They explained that they had just returned from Italy where they had seen a rare “diatret” called the Trivulzio Cup. This kind of late Roman Empire cup consisted of a supporting lattice of linked glass rings holding the cup. There is no other Roman design remotely like it, and nobody knows where it came from or what it signified. Viewed from above, the pattern of linked circular figures looked exactly like the ringed pattern in my cosmic mandalas. When this couple saw my painting, they were instantly reminded of the Trivulzio Cup and was sure it must have been the inspiration. Of course, I had never heard of the Trivulzio Cup before, but felt the unknown glass artist and I shared a similar feeling for geometry. Might such a connection of minds across the ages also appear between civilizations? Left: The Trivulzio Cup, upside-down. Right: A close-up view of a diatret dating back to the 4th century, found in Cologne. In the first painting in the series, the one Carl fell in love with, I had written the text entirely myself — my conception of how our species might be described in a galactic encyclopedia. What I really had in mind was the internet, but that was 20 years in the future, so I didn’t call it that. The next painting in the series depicted a network of connected civilizations in a globular cluster orbiting the Milky Way, a network of networks forming a single civilization. With Carl’s help I developed the text that describes this vast and ancient network of planets. Here’s an example of how we worked: I had read about a then-recently discovered organic superconductor called dimethlytetrafulvalene tetracyano-quinodimethane. It seemed to me that life on planets around cool stars, such as those in globular clusters, might use such materials for energy transfers. Carl liked such a precise identification of the biochemistry (“Much more interesting than saying ‘silicon-based’,” he said). But he urged me to change the last syllables to read “methanic acid,” to signify the substance as more reactive and also allusive of the nucleic acids that code all life on Earth. Frank Drake, a Cornell radio astronomer and SETI pioneer (and later my boss on the Voyager Golden Record) helped me work out the depiction of pulsars as navigational beacons. During the production of Cosmos in Los Angeles, Carl decided to name one of the episodes “Encyclopedia Galactica” and the episode closes with a roster of imaginary galactic civilizations. Some of the text was lifted straight off the paintings’ legends and appears in the book version of Cosmos, still the best-selling science book of all time, in print 30 years after publication. Now I have combined all the various elements of the Encyclopedia Galactica, together with some of my other imagery developed over the years, into a final master image, perhaps my last word on the subject. For an enlarged version of the new poster or to order it today, visit MyScienceShop.com.